When the old sign on the corner of Band on the Wall was removed during the renovations of the venue in 2009, the visible traces of a much older sign were revealed. Stained into the façade above the old doorway, it reads McKENNA. The lower portion of the sign is permanently obscured, but may have read VAULTS of WINE & SPIRITS. 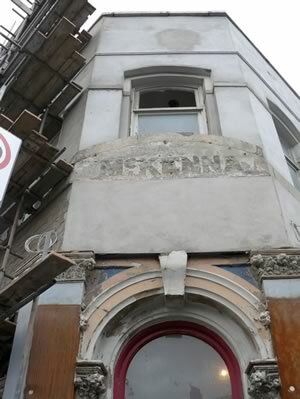 The sign may date from 1856, the first recorded date for the McKenna ownership of the George & Dragon, the historical name of Band on the Wall. Physical evidence of the McKenna connection is also visible high on the façade of The Picturehouse building at 29 Swan Street – part of the renovated Band on the Wall since 2009. Above the segmented oriel window is a stone shield or gablet that displays stylised initials, ‘McK’. 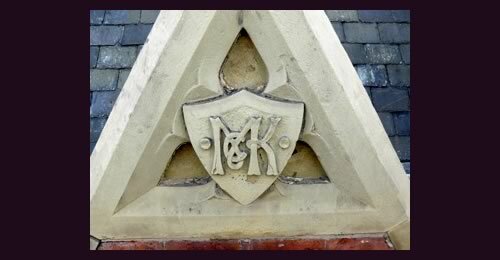 This monogram may date from c1865 when, according to the English Heritage Listing citation, it is thought that this Grade II listed building was built, though our research has been unable to confirm this date. There is very limited information available from the 19th Century about the construction and adaptation of the buildings that comprise the present Band on the Wall, though we have attempted in Chapter 4, The Building/s, to describe the rough patchwork of detail that exists and to present, at times speculatively, details of the physical evolution of the building.